History: Hospet was once the stronghold of the mighty Vijayanagar Empire while Hampi was the capital of the Vijayanagar Empire. 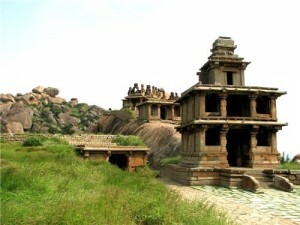 Most of the remains of the Vijayanagar Empire are accumulated in the places near Hampi mainly in the sites of Hospet. And Hospet is the perfect center for the visitors of Hampi. 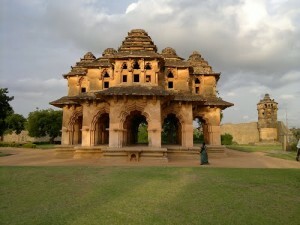 It is just 13 km away from Hampi and it is also known as the gateway to Hampi. The findings from the excavation of Hospet reveal the involvement of Hospet in the history of Karnataka. Introduction: Located 340 kms away from Bangalore, Hospet in Karnataka is an ideal haven for those who want to visit the architectural remains of the temples of Vijayanagar Empire. On all sides of Hospet, you can see large hills made of granite boulders. Hampi lies 13 kms form Hospet. Hampi is the site of the ruins of temples. Hampi is at a distance of 340 kms from Bangalore. 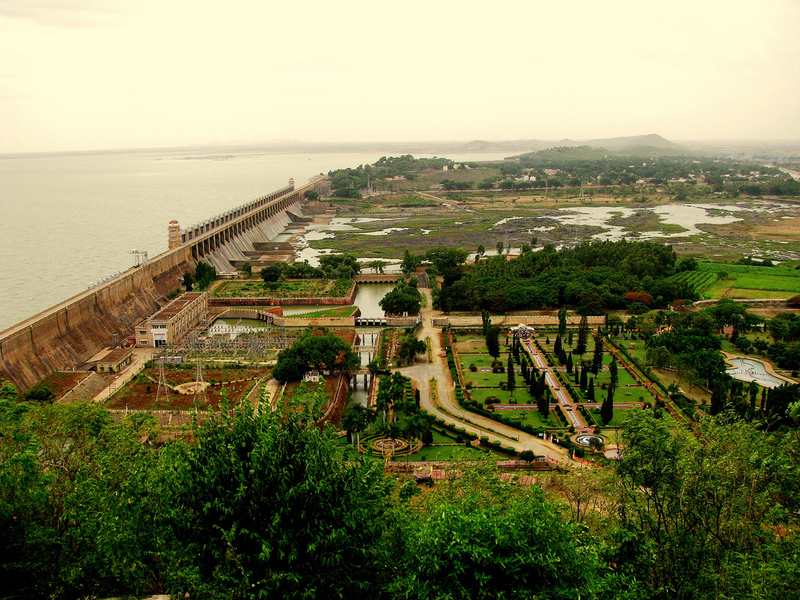 Another place worthy of visiting in Hospet is the Tungabhadra Dam based on the Tungabhadra River. You can also visit the famous Japanese garden at the base of the dam. It is mainly an agricultural service town, although there are a number of big iron mines and steel mills in the area. architecture. Situated on the banks of the Tungabhadra River, Harihara is another attraction of Hospet. 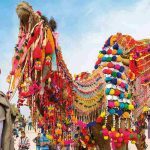 The holy town of Harihara has several thousand devotees coming to the place to relieve themselves of their sins. The legend goes that the union of Lord Vishnu with the Tungabhadra River can cure any ill person. For that, the patient will have to have a bath in the river. Travel information: Tourist importance of Hospet lies in its proximity to Hampi, the site of the medieval Vijayanagar Empire. Though the place of Hospet is not so large yet, the place has some of the best hotel that provides furnished accommodation to its visitors. The nearest airport is situated at Bellary about 75 km from the place of Hospet. The Bangalore and Belgaum airport is placed about 350 kms and 200 kms. 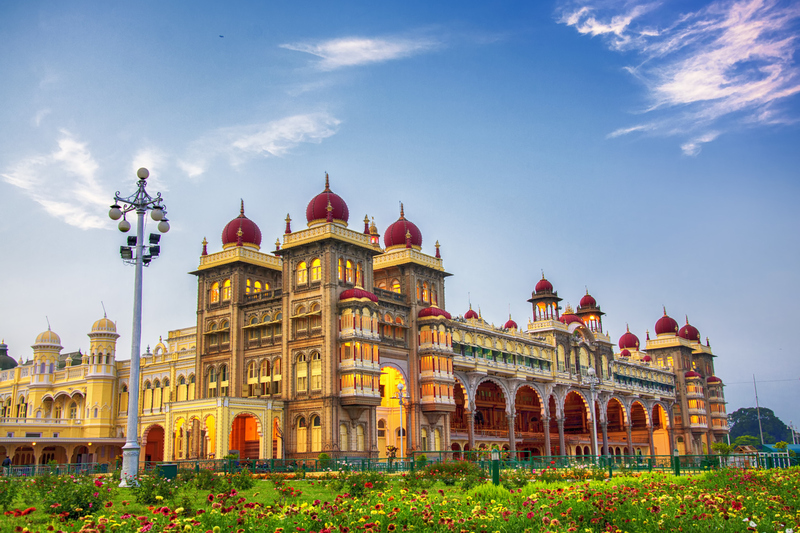 The ideal time to travel to Hospet is September to February. By Air: Airports near Hospet are at Bangalore about 350 km and Belgaum about 200 km well connected by Indian Airlines flights to most parts of India. By Rail: Hospet Railway Station is well connected by rail line to Bangalore, Hyderabad, Hubli and Vijapur. By Road: Buses are available from Hospet and regularly ply between here and Bangalore and other major cities of Karnataka. Monuments of Hospet: Sasivekalu and Kadalekalu Ganesha: Sasivekalu and Kadalekalu ganesha are two huge stone images of Ganesha on the slope of the Hemakutam hill. 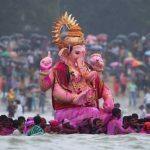 The Sasivekalu Ganesha is about 2.4 metres high and ironically named after the mustard seed. The god is seated in a large and open mandapa, with plain rough square pillars. The right hand holds the ankusa and broken tusk, while the upper left hand holds a looped pasa. The lower left hand and the trunk are broken. The other monolith in the same vein, is the Kadalekalu or the groundnut Ganesha.The huge seated god, carved in the round out of a massive bo. Hospet Virupaksha Temple:The Virupaksha Temple has been considered throughout centuries, to be the most sacred of the temples at Hampi. The main shrine is of Lord Shiva and is in the form of a linga. The name Pampapathi is from the fact that he married Lord Brahmas daughter Pampadevi. 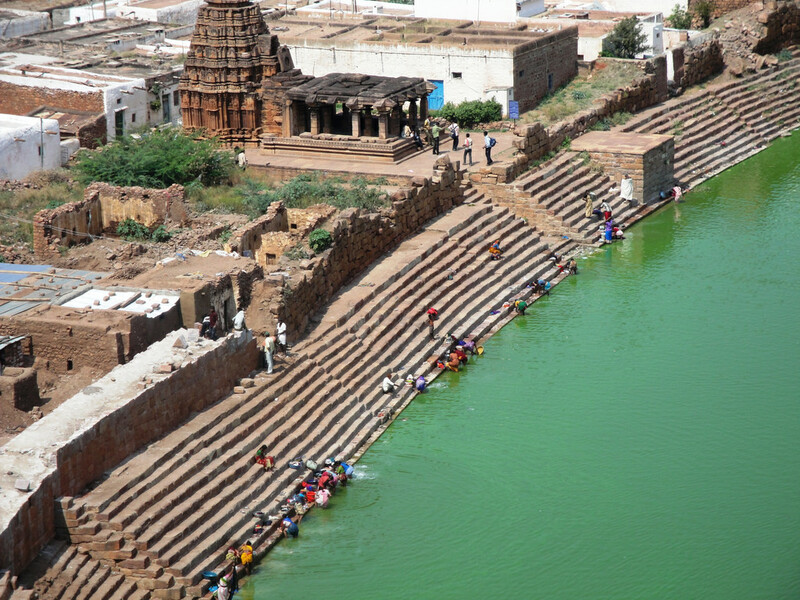 The temple is situated in the picturesque surroundings on the southern bank of river Tungabhadra near Hemakuta Hill. The 52-meter high main gopura or the tower has nine storeys and faces the Virupaksha bazaar, the first two storeys are in stone and the rest in brick and morter.The second gopura with three storeys in the inner sanctum.The second gopura with three storeys in the inner sanctum was built by Krishnadevaraya, the most powerful ruler of the Vijayanagara Kingdom, during which the dynasty was at its golden peak, with its vastness increasing from Cylone to Orissa. The Rangamantapa was also built during his period; it has 5 aisles and 16 composite pillars to support the structure. Till date one can see the stucco work and paintings depicting scenes from Ramayana and Mahabharata. Another interesting feature of this temple is the water from Tungabhadra River, which flows in a narrow channel along the terrace of the temple, then desends to the temple kitchen and finally flows through the outer court, back to the main stream. The bazaar facing the main gopura is called virupaksha bazaar where once upon a time, priceless Rubies, emeralds, diamonds and precious stones were sold in weighing scales,it consists of a wide and long road with two storeyed stone built consists of a wide and long road with two storeyed stone buildings on either side. To the north of the Virupaksha temple, one can see about 20 shrines, which are probably among the earliest temples at Hampi. Which have a mix of South Indian and Chalukyan features, you can also see many Jaina temples around this site. Lakshmi Narasimha: The image of Lakshmi Narasimha,better known as Ugra Narasimha, is hewn out of a single monolith. Which has been very badly mutilated. It shows Narasimha seated with Lakshmi on his left lap. At present, except the right hand that embraces his back, the whole figure of Lakshmi the thighs and legs of Narasimha are mutilated. The sculpture was damaged during the attack of the capital by the victorious Bahamani sultans in 1565 A.D. The Narasimha statue with an articulately chiselled crown and large eyes still retains his awasome charm. Above him rises the stately Adisesha, the seven headed snake serving him as a canopy. On top of the head is a carved lion’s mask. The entire image of Narasimha is set within a makara-torana. This image is about 6.7 metres in height. It was carved out in 1528 during the rule of Krishnadevaraya. Though the image is enclosed by walls and a passage, the roof if at all contemplated, was obviously never completed. Only a few metres to the left of the nrasimha image, is the Shiva linga, cut out of a huge boulder and is popularly known as Badavi-linga. It is completely intact and measures about 3 metres in height. It is enclosed by walls and a roof. The base of the linga is perenially under water. 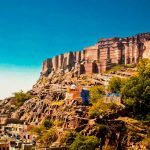 Hazara Rama Temple: The Hazara Rama Temple is a veritable picture gallery with its walls and pillars representing a highly artistic and magnificent attempt to capture in stone the immortal legends of Ramayana. The most prominent, among the reliefs of Ramayana in the temple are those of the Rishyasaringa performing the putra-kamashthi yaga, Sita’s svayamwara, and Rama shooting an arrow through seven trees. On the columns of the sanctorum are two small reliefs of Vishnut attempt to capture in stone the immortal legends of Ramayana. The most prominent, among the reliefs of Ramayana in the temple are those of the Rishyasaringa performing the putra-kamashthi yaga, Sita’s svayamwara, and Rama shooting an arrow through seven trees. On the columns of the sanctorum are two small reliefs of Vishnu. On the columns of the sanctorum are two small reliefs of Vishnu in the form of Rama Avatara. The exteriors of the north, east and west walls depict five friezes, showing elephants, horses, infantry, dancing girls and scenes from shri Krishnaleela.The Hazara Rama temple, which was probably begun by one of the ealry Vijayanagara rulers, represents many interesting transitional features. The main entrance-porches with their early architectural features. The main entrance-porches with their early architectural features, the presence of early type of pillars in other parts of the temple, and the absence of gopuras tell us that the temple dates from an earlier period. The inner courtyard has finely polished pillars over which the roof is supported. The ornate Amman shrine with its bas-reliefs of a royal personage was perhaps an addition made in the time of Krishnadeva Raya. The name of the Hazara-Rama temple is populaly taken to mean the temple of the thousand Rama’s on account of the numerous Ramayana bas-reliefs on its walls. 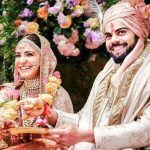 But the temple was evidently called Hajara-Rama, because it was the palace-temple and was also at the entrance to the royal palace-enclosure. One can also see a long monolithic stone turf outside the temple, which was probably used to feed the horses of the people visiting the durbar. Stepped Tank: The recently excavated stepped tank made out of black schist, is very ornate and it is one of the most beautiful monuments. This small but neat tank measuring about 22 meters in square, and 7 meters deep, has 5 distinct tiers of steps fitted in pleasing pattern. This tank is very proportionate in terms of design. The mason marks on each step shows the exact position and direction in which it had to be placed, this only reveals that the whole stepped tank was pre-fabricated elsewhere and later assembled in the palace area. The water to this tank was drawn through the intelligently designed stone aquaduct which is well preserved till date. 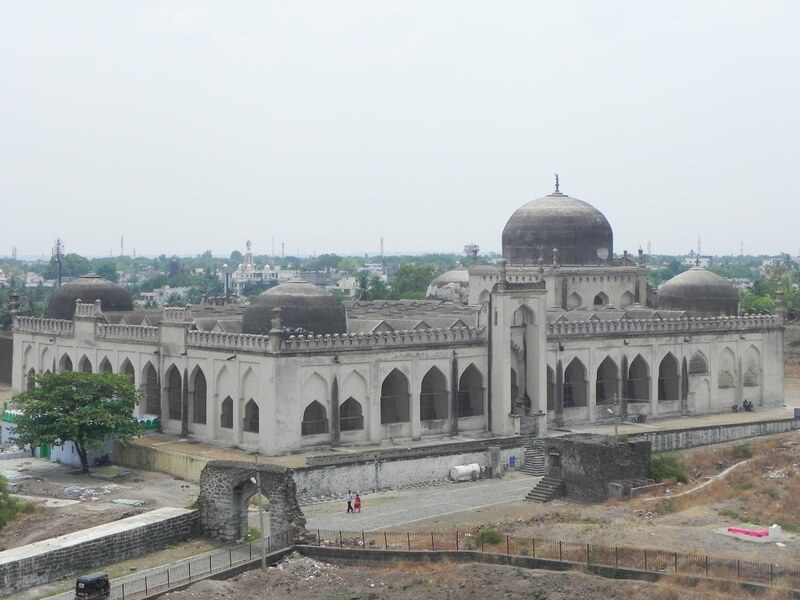 The massive stone basement called the Dasara-dibba or Mahan. have been gorgeously painted and decorated, having pillared hall of several storeys. 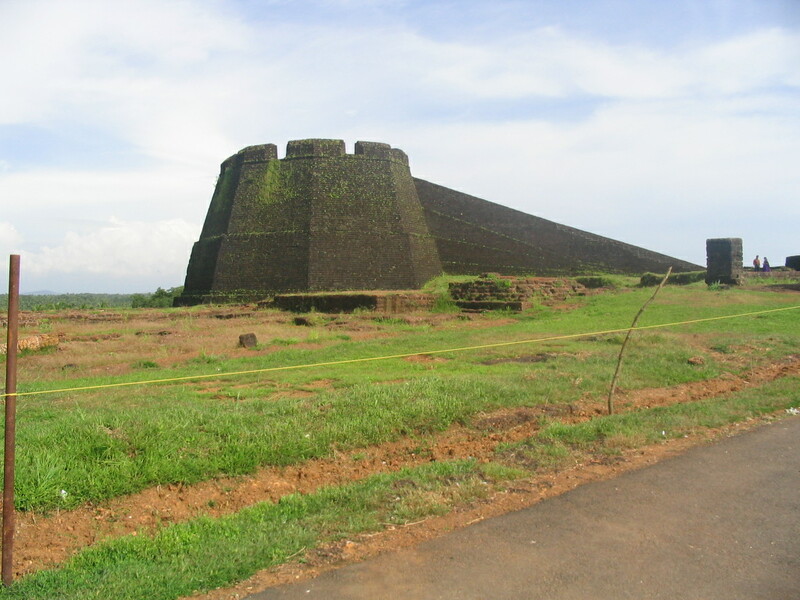 Contemporary records refer to the beautiful super structures on the Mahanavami-dibba and the other platforms, but of these there is no trace now existing. The remains consist of a massive square granite-faced base in three diminishing tiers, the lowest being 40 metre square and the topmost 24 meter square. The structure faces West. 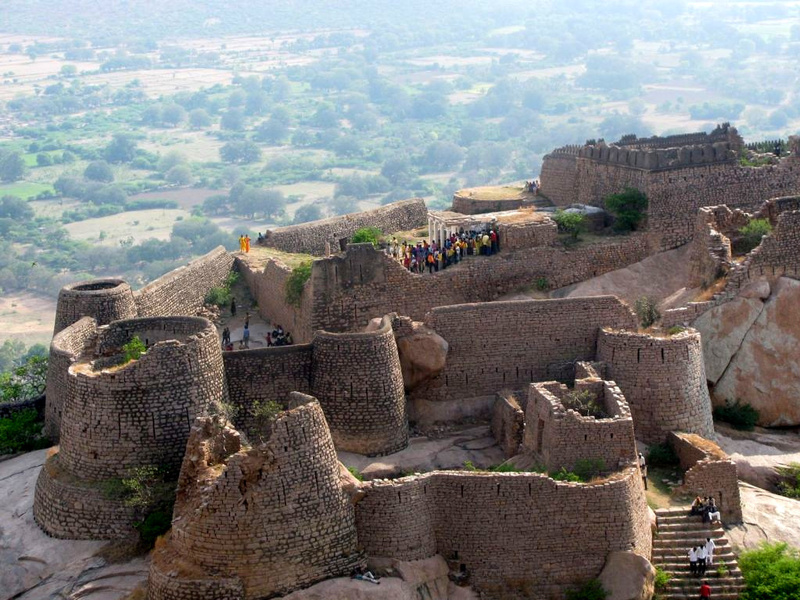 The walls of the tiers are covered with rows of boldly-carved horizontal friezes of horses, elephants, warriors, dancers,musicians. A group of people with plaited hair and conical eyes represent members of Chinese Embassy. Another interesting relic near the north face of dibba is a huge monolitic stone door, which imitates the wooden original including bolt and socket. In front of the mahanavami dibba One can see large and ornate granite base generally believed to represent the remains of royal palace. Also seen square chamber below ground level, which must have been a place to conduct secret meetings. Lotus Mahal: The structure is a fine representation of Hindu Sikharas, which are the horizontal pyramidal-stepped variety with neatly workd out stupis on top. It is probable that music concerts were held on the lower floor for the benefit of the womenfolk of the royal family. 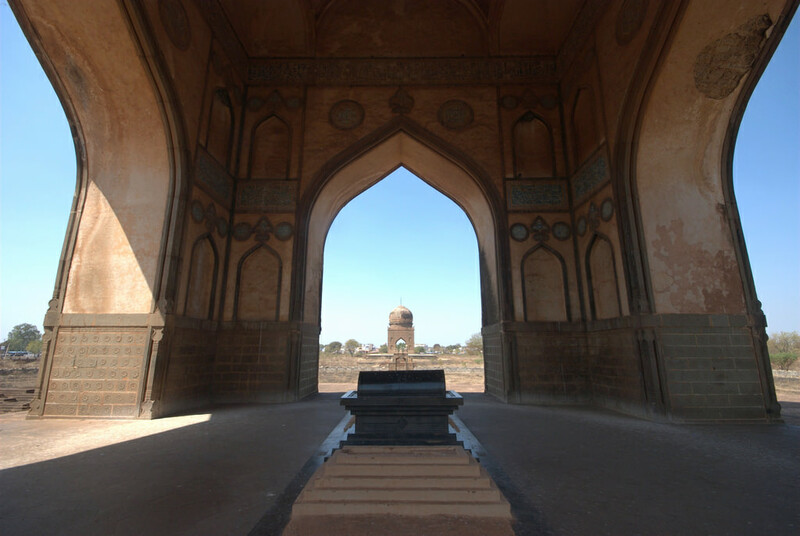 To the south east of Lotus Mahal one can see an octagonal watch tower which has arched openings in 2 layers, the lower half of these openings are covered with walls, which is evident that the woman folk used this tower to have a glimpse of the activity beyond the zenana enclosure. Elephant Stable: The elephant’s stable is an oblong building, and is located outside the Zenana Enclosure, it is a structure of considerable size. If any building has greater Islamic character about it, it is the Elephant Stables. Facing west, it consists of a row of eleven rooms, each room with a huge dome for its roof. The central portion of the building has stairways, which lead to the upper pavilion that retains Hindu elements of Architecture, though the super-structure, which was in the form of a sikhara, is now in ruins. The most interesting aspect of the structure is its domes. These huge domes are of different types – drum – shaped, ribbed and stepped-pyramidal shaped. The rooms have lofty entrances in the form of arches and in between two rooms, the exterior has false arched windows. The rooms are so spacious that it was possible to tie four to five elephants in each room. The Elephants were apparently chained to the iron hooks, which still remain embedded in the decorative ceiling. 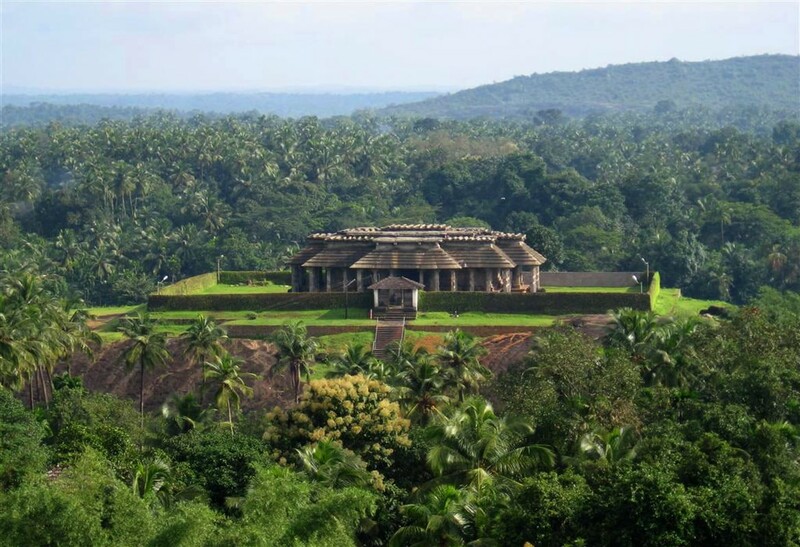 To the south of Elephants stable is the Guards barrack, which is another example of Indo-Sarasanic architecture. 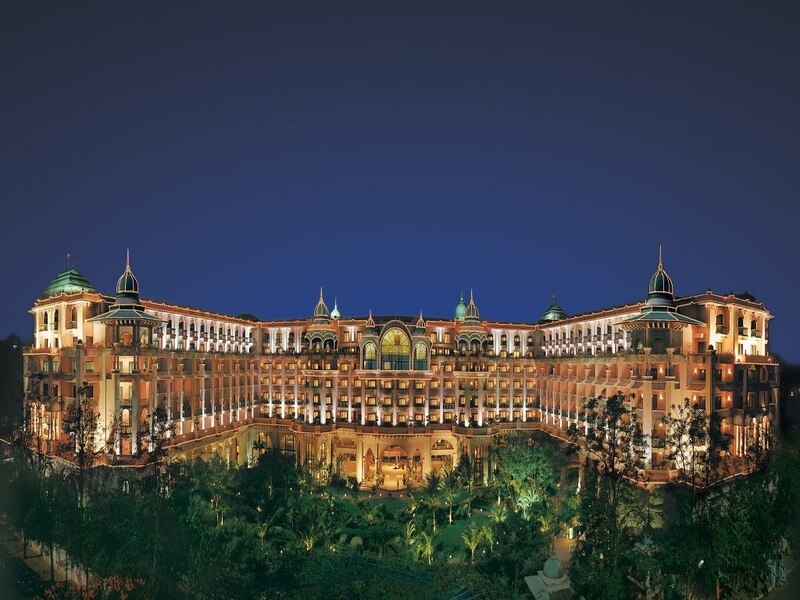 It is also oblong in plan, the facade is made up of a series of eleven arched openings, of which the central arch houses the entrance to the building. Queen’s Bath: One of the best-known structure at Hampi is the Queen’s Bath. Built in the Indo-Sarasanic style, it is severely plain on the exteriors. It is a square building consisting of square bath, which is surrounded on all sides by an arched pillar. The areas of the cloister are pleasing in design and contain some fine stucco work. The ceilings are of different types, ranging from square to round to paramedical in design. More interesting are the arched balconies, which project over the bath. The fresh water to the bath was supplied through a channel. The bed of the bath is provided with holes to drain the water. This was probably used by the women folk as a recreation spot. Hospet Vittala Temple: The vittala temple is the most magnificent of the religious edifices at Hampi. The Vittala temple stands on the southern bank of the Tungabhadra and may be reached from the west by walking on from Hampi bazaar along the riverbank, or from the east through the Talvaragatta Gateway. The Vittala temple potrays the high watermark of perfection of the Vijayanagara style and one may well say that there is no other building which could stand in comparison with its florid magnificence. The temple stands in a large rectangular enclosure (164m x 94.5m). 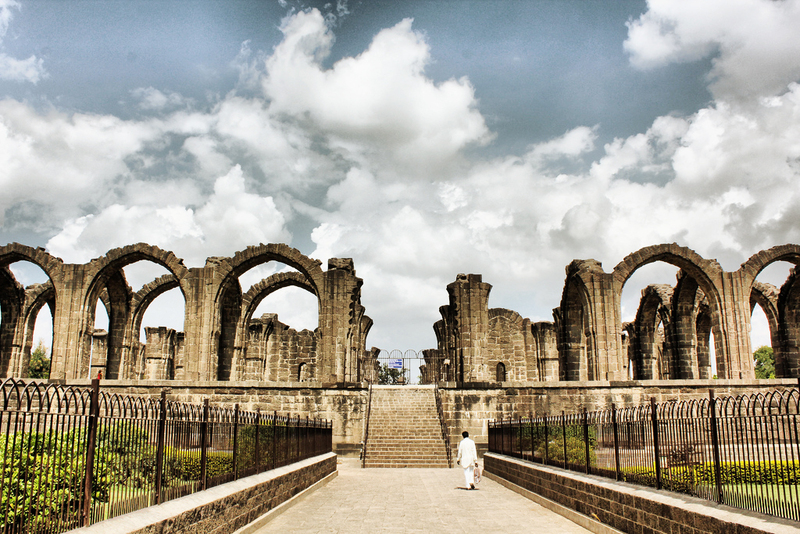 The three lofty Vijayanagara gopuras on the east, north and south are now dilapidated. The main temple was dedicated to Vishnu in the form of Vittala. The mandapa contains 56 pillars, each 3.6 meters high, 40 of which are regularly disposed to form an aisle. While the remaining sixteen form a rectangular court in the center. Each pillar is a massive composite sculptural unit measuring as much as 1.5 meters across and are a group of monolithic sculptures. The Vittala Temple was the most ornate and proportionate temple of its time. The interesting part of the pillars, which have musical motifs, is the kind and quality of sound one can hear when struck. These pillars are of different size, shape, length and width, which makes them give sounds of different musical instruments. One might note that these are monolith sculptures. 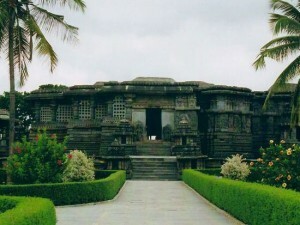 This temple is a living example of the scientific development during the Vijayanagra period. 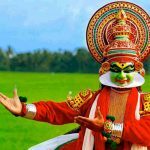 It is said that during that time the temple exteriors were probably covered with thin muslin cloth from the hooks as seen, to make the sound echo in the central courtyard where the dances were performed. It is also said that one could hear the musical pillars from a distance of 1.5 kms. The temple is now in a damaged condition due to the attack of Bahamani invaders in 15 th century, who burnt the temple due to which the clarity of sound has drastically come down.Another important monument in the temple complex is the Stone Chariot, dedicated to Lord Garuda, the vehicle of Lord Vishnu. Till date one can clearly see the paintings done during that time. The best part is that the stone wheels in the chariot still rotate. The other mandapas in this complex are Kalyana mandapa and 100-pillard hall, which are also worth seeing.